If you're on the hunt for a casual yet incredibly stylish outfit, choose a white dress shirt and a beige lace maxi skirt. Both of these garments are very comfy and they also look great paired together. When it comes to footwear, this outfit is complemented really well with Adrianna Papell Teagen Block Heel Sandal from Nordstrom. Make a navy and white floral fit and flare dress your outfit choice for a neat sophisticated look. Adrianna Papell Teagen Block Heel Sandal from Nordstrom complement this ensemble very well. If you don't like being too serious with your combinations, rock a beige embellished midi dress. Kick up the cool of your ensemble by complementing it with Adrianna Papell gold leather heeled sandals. If you're scouting for a casual yet incredibly stylish ensemble, pair a light blue cropped top with light blue skinny jeans. These two items are totally comfortable and will look great together. And if you want to instantly kick up the style of your look with one piece, enter Adrianna Papell Teagen Block Heel Sandal from Nordstrom into the equation. Consider wearing a blue skater dress to bring out the stylish in you. Got bored with this getup? Enter Adrianna Papell Teagen Block Heel Sandal from Nordstrom to jazz things up. Go for an olive chiffon evening dress to look truly gorgeous. For something more on the daring side to finish off this look, throw in a pair of Adrianna Papell gold leather heeled sandals. Rock a light blue print off shoulder dress for an unexpectedly cool ensemble. 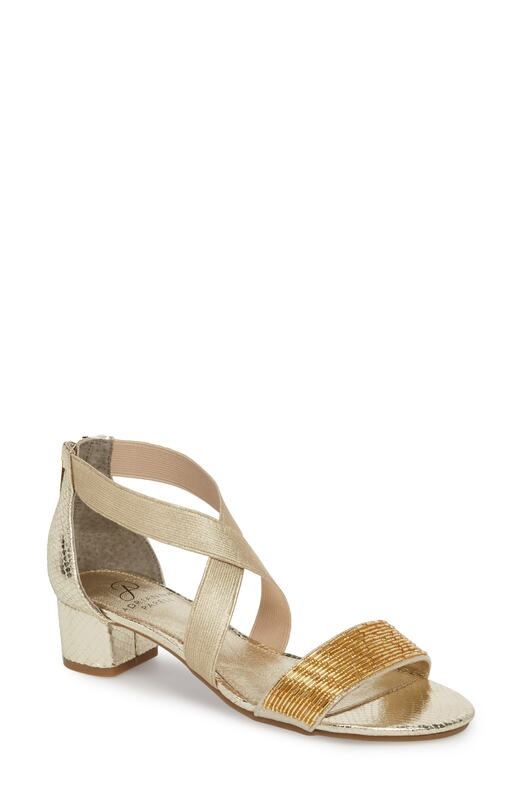 Perk up your look with Adrianna Papell Teagen Block Heel Sandal from Nordstrom. For an outfit that provides comfort and style, wear a pink floral cami dress. You could perhaps get a little creative in the footwear department and elevate your getup with gold leather heeled sandals.